May 2017 – Hola, Konnichiwa! This project took me half the day, but I needed it. I wanted a way to see, sort, and search all the vocabulary I’ve learned from WaniKani. 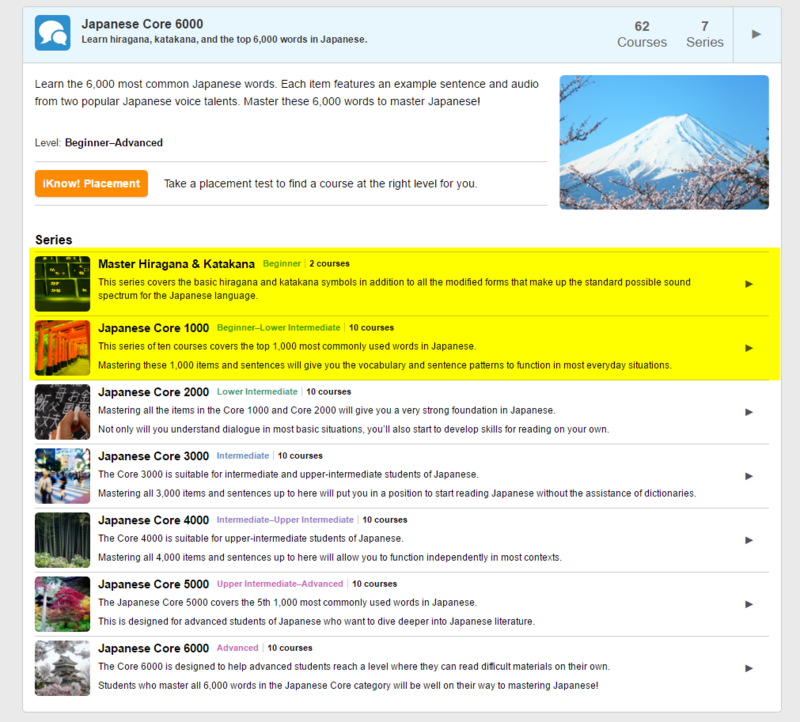 The WaniKani site has a search field, but it doesn’t give Parts of Speech nor is sortable. Why did I want this? In KaniWani (a separate site that drills you on the WaniKani vocab), instead of showing you the kanji, they show you the English meaning, and you type in the Japanese translations. What messed me up a lot was all the synonyms! The table I made includes ALL the vocabulary I learned! I’m splitting them up in a page per 10 levels, so that includes approximately 1000 words. Page 1 is done, so that’s the first 10 levels! I added a column with the Parts of Speech that will hopefully help me distinguish some vocabulary going forward. How does this help me? Say I want to see all the words that can signify “action”. I just type “action” in the search box and I see there are four words in levels 1-10 that contain that word. Or maybe I want to find all the verbs that end in る. There are 95! Maybe I just want to see the vocab from level 7. I just type 7 in the search. So handy, I love it! This is all very rudimentary compared to the real databases and web programming I used to do in my career, but it got done fast and fulfills my goal. I just used the WaniKani API into Google Spreadsheets and sorted/displayed the data just how I wanted. I added a new URL column that adds a link directly to the WaniKani page for the word. With a second new column, all my time was taken up by manually inputting the Part of Speech column, which isn’t given by the API, ouch. Then I added it to a huge WordPress Table Press table in my blog. I’ll be adding other levels as I get to them. I first looked into iKnow over a month ago, as I’d heard it was a great tool to learn vocabulary. At first glance, the website interface looks great – that is important to me if I’m going to spend any time on it. The soothing sky blue (it literally is a sky background) helps me focus during drills. But it is not a free service. I had to decide if it’s worth it for me. I could, after all, just import these decks into Anki for free. This service offers several Japanese courses to get you well on your way to mastering Japanese, up to Japanese Core 6000. Right off the bat, you should take a placement test to determine which course you should take. At my beginner level, I was sent to the very beginning courses – kana and Core 1000. Highlighted in yellow below are the three courses I’m currently working on. Two courses in Master Hiragana and Katakana (easy review for me), and a more challenging course of Japanese Core 1000 – the top 1,000 most commonly used words in Japanese. I immediately starting using these to solidify my kana skills. Before using this service, I’d estimate I was instantly accurate with ~97% hiragana, and ~90% katakana. I just needed exposure to the ones I don’t see a lot. My goal is to instantly recognize and be able to type kana accurately, as I do in words in English, so the iKnow! Master Hiragana and Master Katakana courses are just what I needed. I usually just do the basic iKnow training drills, first one in the option below. They call their drill types “Apps”. In the first drill type (I am not comfortable calling them apps), they show you a character, you hear it, then you type it. You also get a drills where you choose it from a list of answers. Sometimes you don’t get the audio. I do these very fast, as my goal here isn’t learning them, it’s more as a review to improve speed and accuracy. It uses spaced repetition drills, like most of the services I use. I have to admit I am a bit confused when today it said “Course Completed” with my Hiragana course. I haven’t spent enough time to master anything at all, much less move all terms to “Strong”. It was moved to a different “Review” tab, I’m not sure why. My Study Progress in Hiragana is 100% though, so I guess I studied them enough so they assume I know my Hiragana. I’ll soon reach that in Katakana too, I purposely was going a bit slower with that one. Out of this Core 1000, they introduce 100 at a time, so I’m on Step 1. My first exposure was over a month ago with these and it was just too overwhelming for me, I couldn’t continue. So much kanji and grammar I just didn’t know, I thought I’d come back when I knew more. I revisited this week and it is now much more manageable. I’m going to take it very slow though! I’ll do five at a time for now, until my grammar gets more advanced. I am required to be able to put whole sentences together, and there are tenses I’m barely familiar with (haven’t officially learned yet). 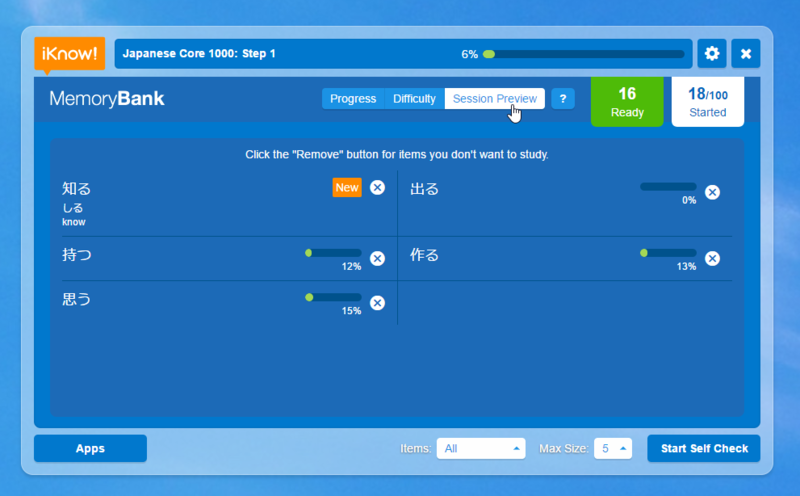 At WaniKani Level 10, I do know all the kanji and vocabulary they’ve given me so far, you can see samples below. As for using them in sentences, I can just barely figure it all out, lol. I know all this will be super easy for me in a few months worth of study, but I’m only on Month 3 of learning Japanese right now. Here’s some sample sentences I am to put together, thanks to both NihongoMaster and WaniKani, I can tackle these, but it’s all so very new to me! Putting it all together is a little daunting, but I know this is great exposure for me. I like looking at pictures. I stayed at my friend’s place for the night. I went to my grandma’s house during summer vacation. When choosing their Sentence Trainer app, they quiz you on various things, listening, reading, and writing sentences. In one example, you hear the entire sentence, then fill in the missing blank. Well that’s easy enough for me! They offer up to three hints if you have trouble. My next drill was a bit more challenging, I hear a sentence and have to type it all out myself! I needed to use one hint – they gave me “まいあさ” – every morning. I should’ve known that, but just haven’t been exposed to the actual word yet in my studies. Next drill type, they give me the English translation and I have to sort out the Japanese sentence. This is a simple one! So for these first five exercises, I got them all right, and used one hint. Time was inflated because I took screenshots and came back here to blog about it! Yay, I love Sentence Trainer! Here are the sentences I worked with for my first attempt with Sentence Trainer app. Motivating with Progress tracking and achievements! I am definitely enjoying the service, it’s getting me exposure and practice to so much. 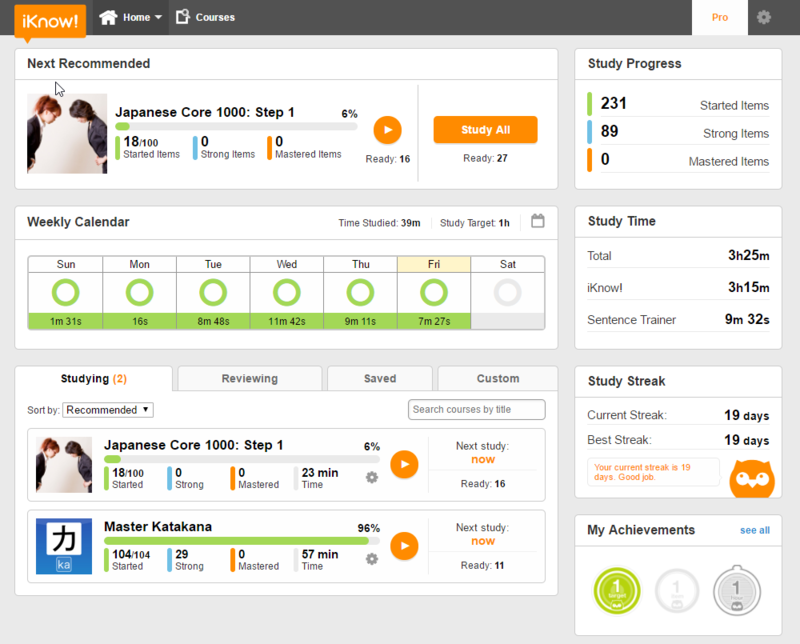 I love how it motivates you by keeping a calendar and tracking your “Study Streak”. Right now my Study Streak is 19 days! You also earn Achievements. I will need more work with the Core courses before I can give a better description on how it’s really working for me, but I signed up for a Pro account and am going to give it a few months. If you register for a 12 month Pro account and use this link, you’ll get three months free. I’m already on a plan and don’t get any months free, but at least it could help you! Are you already using iKnow or have you tried it in the past? What are your experiences?